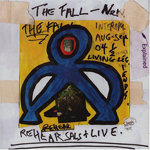 The first Fall LP not to be trailed by the late John Peel opens with three tracks first heard to magnificent effect in the band’s 24th session for his programme. As suggested by the title and liner-notes, the truculent Mark Smith has leant away from the quality production of this session and recent studio album The Real New Fall LP. The good news is that, even in the parlous state of most of these recordings, the band sound wonderfully tight and Smith of admirable vocal prowess and confidence. Hearing him humming as he walks towards the mic at the beginning of the opening ‘All Clasp Hands’ is a good sign, as is the playfulness in his voice during an early version of ‘Mod Mock Goth’ that recalls his vocal on ‘Eat Y’Self Fitter’ from all those years ago. Happy moments borne out of the shambolic organisation of the material include Mark introducing his band on stage midway through the album and, about forty minutes in, introducing ‘Theme from Sparta F.C.’ thus: ‘Good evening, I am Mark E Smith. We start tonight with the theme from Sparta F.C., a film yet to made by the great director Xyralothep, your true God’. The weird production on this song is fascinating, with Eleni Poulou, whose keys enliven the open track in classic Fall fashion, singing strangely out-of-sync backing vocals into a kind of sonic vacuum. A heard-from-inside-the-washing-machine mix of ‘Green Eyed Loco Man’ fades into Smith riffing over an instrumental version of the same song, ‘the way the fantasy crashed against, crashing into the rocks of reality’, which recalls the reconfiguring of an instrumental ‘Escape to Xanadu’ on 1992’s The Infotainment Scan, Smith caressing the vocals and sounding his old self, something many people had given up expecting as much as ten years ago. There are pleasing early lyrics to a sluggish ‘What About Us’ (a song which references Harold Shipman, although not in this form): ‘we are living leg ends / we are well cocked’, and those fascinated by Smith’s lyrics will enjoy the change from ‘By hook or crook I’ll get it back’ to the more nationalistic ‘By George I’ll get it back’ on ‘Sparta’. The studio / live / rehearsal soundscapes rub up against each other nicely. Yes, Smith may not be releasing the cutting edge new album many people crave, but the material here is far stronger than, for example Brix Smith’s riffing over ‘Glam Racket / Star’ from 1995’s live and studio recording The 27 Points. Of the older songs, a superb version of ‘Spoilt Victorian Child’ does a wonderful job of coming alive without seeming to go through the motions as did, for example, ‘The Joke’ on 2G+2. In fact, such is its sympathy with the original that, helped by the fluctuating volume levels, I was reminded of its musical affinity with ‘Petty Thief Lout’ from the same era. It is only Steven Trafford’s bass that sounds notably different in style from the original; but then who could copy Steve Hanley’s bass style convincingly? An excellent, fascinating mess to trawl through. Add to this a great cover by Pascal Le Gras which even receives a credit this time around. Although he’ll never see it, Peel achieved his wish of getting the complete Peel sessions, which are now scheduled for early 2005, released. Sadly, it will now be a summative document. Happily it will peak with Smith assembling a band that compares with the glory days of the 80s and early 90s. As Peel said, the good ship Fall. You don’t really need anyone else.